Yes, the Spring equinox ix on its way, unless you are reading this after the 20th March 2014. It’s been a lovely build up to Spring this year, albeit wet. The warm temperatures have encouraged early growth and with a little luck there’ll be no heavy frosts to damage young shoots – but let’s not be too complacent. This week has been especially warm and sunny and of course that creates a spotlight for all those gorgeous vibrant spring flowers that have already popped up: the Galanthus, Crocus and early Daffodils. These Narcissi ‘Paperwhites’ have been in constant bloom in my garden since January and are utterly gorgeous. 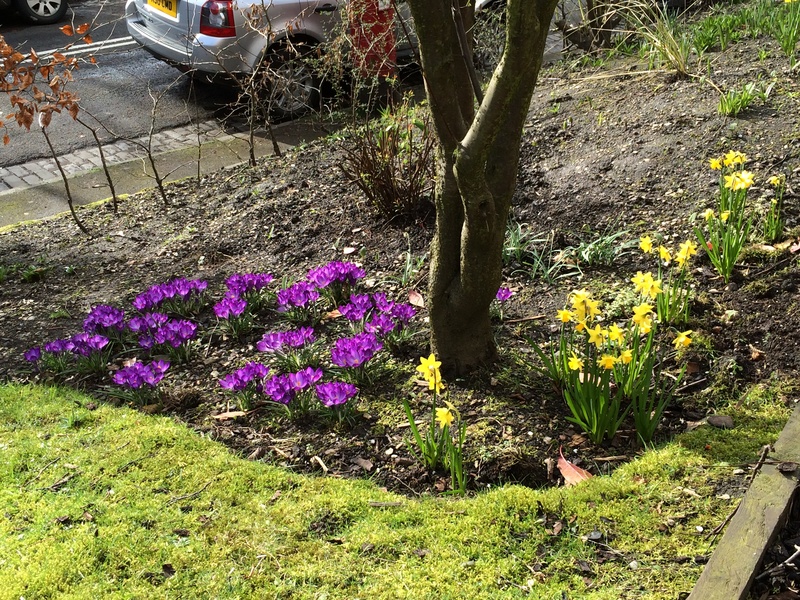 They are quite delicate but surprisingly robust at the same time.In the Crescent Garden the Narcissi Tête-à-Têtes are vibrant against the purple Crocuses. Just beautiful. I am waiting with baited breath for my favourite spring flowers – Fritillaries. With their chequered heads they look like tiny jockeys bobbing around in the grass. That sounds a bit ‘Alice in Wonderland’ – sorry. In a client’s garden, we are watching for her Erythronium californicum ‘Harvington Snowgoose’ with its subtly mottled leaves which are just appearing before the large, pergoda-shaped flowers. Something else that is special about this time of year is watching out for the little red shoots of perennials such as Paeonies and Astrantia. They are tiny buds of intense colour in the winter soil. Also coming up are those elegant leaves of the Tulips – they remind me of a sophisticated evening wrap Grace Kelly would have worn. They serve to break up the bare ground and create colour and coverage at this time before bursting into bloom as my daffodils fade. But even more alluring is the realisation that beyond all this Spring glamour there are still plants that have not shown themselves yet and there is the thrill of more to come. If you are like me, despite my endless lists and plans, I still forget some of the plants that are there and am delighted to see them suddenly appear like long-lost friends. We have made a significant addition to the Crescent Garden by planting six ornamental Cherries – two each of Royal Burgundy, Fragrant Cloud and Pendula Rubra. These should give us a fabulous burst of colour in the spring, red, pink and white, clearly visibly from the houses and road. Planting trees carries some weight. It’s a strange feeling to think (hope) that these trees will be there in years to come for other people to appreciate looking out of their windows. They may never give a second thought to who planted them or why, but that in itself is rather liberating and special.